I have read conservative recommendations on the life span of an ink: one year. Wow. I have definitely used inks longer than one year, and own inks that are much older than one year old! If it doesn’t smell really weird, and if is clean (doesn’t have chunks or slime in it), it’s very likely perfectly okay. 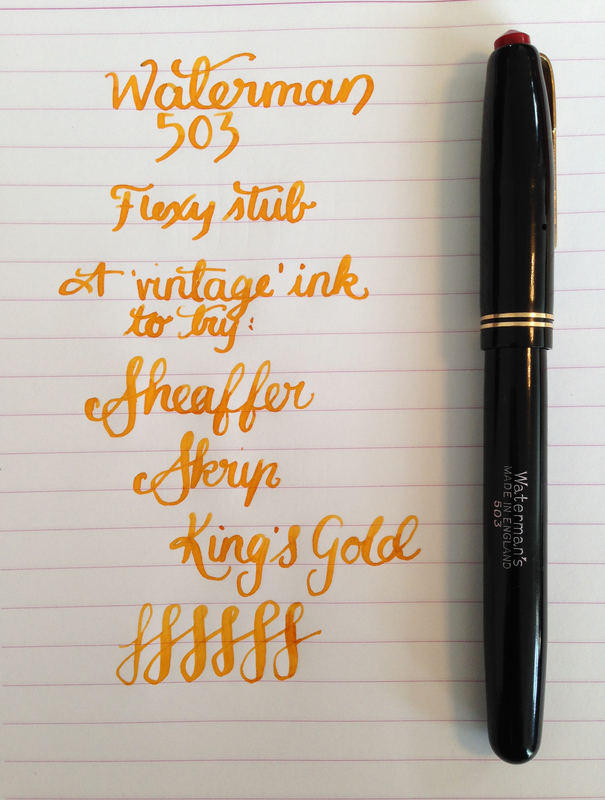 I like Sheaffer Skrip King’s Gold – it’s a legible yellow that shades nicely when used with a flex nib. This entry was posted in Ink, Vintage Pens and tagged Handwritten, Sheaffer. Bookmark the permalink. Follow any comments here with the RSS feed for this post. Post a comment or leave a trackback: Trackback URL.